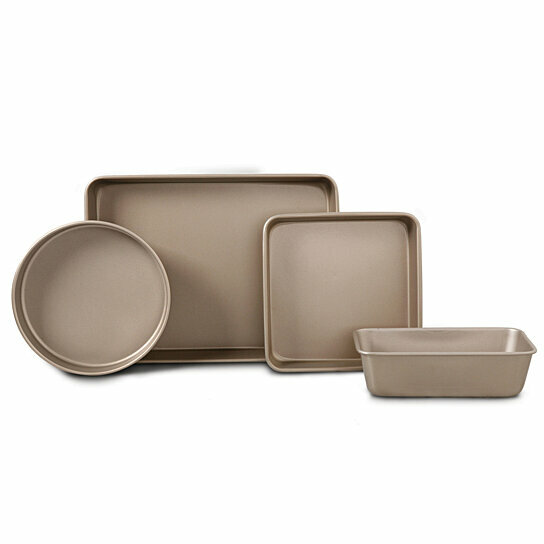 Baking your favorite dishes and desserts has never been easier with the Gale 4-Piece Bakeware Set by Oster. This set includes different shapes and sizes baking dishes to be able to make anything form breads and cakes to lasagnas. Each one of these pans are made of strong and durable carbon steel to resist chips, cracks and stains. They feature a non-stick coated interior to allow you to bake your favorite foods with little to no oil, providing a healthier alternative than regular baking pans. The non-stick coating also ensures the food will slide right out of the pans, making cleaning a breeze!